An advantage of touring the countryside by canal, is there are no traffic jams approaching the town, usually no parking problems, and generally, no “pay and display”! And, you don’t have to worry about accommodation, or book ahead. You just turn up, and tie up! Since we have started canalling, we have visited villages we have always wanted to see, and visited villages we would not normally have had on our list, like Leighton Buzzard, and Stow Hill. So, what are YOUR favorite spots? Here are some of ours, (in no particular order.) What do you think? Tucked away up a lovely little laneway from bridge 24 on the Llangollen, Marbury is a quaint classic English village. Beautiful Tudor homes, village green and mere’s behind the beautiful old church teeming with birdlife. It even has a classic English pub opposite the green, closed every time we have been there! You have to make a bit of an effort to get to this very attractive little village on the Grand Union Canal. Moor by bridge 32, (Furnace Lane Bridge) take the track by the bridge, (opposite the wharf) and take the road into the village. It’s a pleasant walk, past a stables and attractive homes. The village is centered on the green a couple of general stores/newsagents, a butcher and hairdresser. The pub, the Forrester Arms, overlooks the green. If you walk past the Forrester Arms, and take the next turn left, you will come across the very pleasant Rising Sun. Here is a delightful thatched a typical old England feel inside. Well worth the effort. On the Shropshire Union, Brewood took us a bit by surprise. Lovely winding streets, friendly, very helpful locals, The Admiral Rodney Hotel, (one of the top pubs we have been in) and the friendliest hairdresser for miles. There are a great range of shops, grocer, post office, baker, and newsagent overlooking the old square. Gracious well kept buildings make Brewood as nice a spot as you will find on the system. Idyllic moorings as well! The canal town of Braunston, on the oxford and Grand Union Canal junction has much to offer the canal traveler. Its delightful main street, the Old Plough, the mariner, and lots of good mooring spots. The best spot we reckon is tucked in between bridge 2 and the mariner entrance. From here one can watch the comings and goings at the mariner, wander down to the Mill House pub by bride 91, or cross the Bridge and walk into town. Another classic canal town. The moorings at Great Heywood have been assisted by the opening of the mariner nearby. The spot we like is overlooking Shugbborough Hall, just below lock 13. A really lovely outlook, and close to the village of Great Heywood, and the walks around Cannock Chase. We just had to visit here to see what a town with such a name looks like! pubs, including Roebucks, off Market Square. 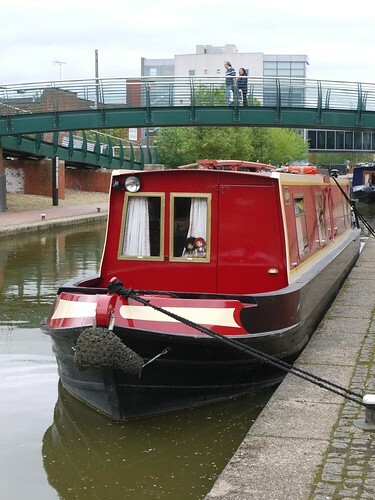 You probably won’t find Milton Keynes in the “Must See” list of many canal travelers. I guess we would never have ventured there had our boat not been moored at Blisworth for a couple of years. But venture to Milton Keynes we did, and we were pleasantly surprised. It is an attractive cruise into the area, through Great Linford, Campbell Park, etc. and there are pleasant mooring spots along the way. Milton Keynes itself is a healthy but never dull walk from the canal, and has everything expected in a modern shopping area. The camera shop there helped us out twice; there are department stores, food outlets and banks galore. But the best part is the area’s to walk around. Great Linford park, the lovely Nags head pub kept us amused for a couple of days. The most beautiful sunsets imaginable are at Napton, on the Oxford Canal. What’s YOUR favorite town or village? ……and tell us all about it!